CEDAR RAPIDS, IA –Join us at the National Czech & Slovak Museum & Library on Saturday, April 9 at 2:00 p.m. for an afternoon of creativity, while learning about alternative comics and beer. Comics & Beer: the Good, the Bad, and the Ugly will teach fun ways to tell stories using simple drawings and creative writing techniques. No prior drawing experience is necessary. And, of course, there will be beer available via cash bar. Tickets are $6 per person/general public and $5 per person/NCSML members; available online at NCSML.org. This event is for ages 21+ only. Do you have a character in your life that would be perfect for a comic? Maybe your cat has supernatural powers, or your creepy neighbor is the perfect inspiration for a villain. Learn how to study the human condition, explore the ways that bodies can be read and represent emotions and character traits. Use the information you glean as fodder for your imagination and inspiration for unique and successful character development. In this interactive workshop we will tell stories, draw images and talk about the roles and attributes of different characters. At the end of the workshop you will have the blueprint for at least one amazing and intriguing character. This workshop will be led by Rachel Marie-Crane Williams, an artist and teacher currently employed as an Associate Professor at the University of Iowa. She has a joint appointment between the School of Art and Art History and Gender, Women’s and Sexuality Studies. Her work as a researcher and creative scholar has always been focused on women’s issues, community, art and people who are incarcerated. She earned a BFA in Painting and Drawing from East Carolina University and an MFA (Studio Art) and a Ph.D. (Art Education) from Florida State University. American alternative/single creator comics and graphic novels have been at the heart of Rachel’s creative scholarship for the past few years. 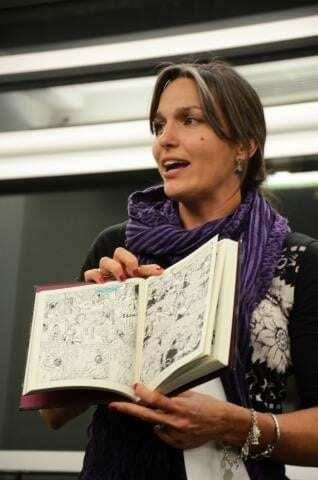 Her graphic scholarship has been published by the Jane Addams Hull House Museum, the Journal of Cultural Research in Art Education, and the International Journal of Comic Art. Her current projects include a graphic novel about the Detroit Race Riots of 1943, a mini comic about police brutality and The Prison Chronicles, a series of stories about working in women’s prisons. The National Czech & Slovak Museum & Library is located at 1400 Inspiration Place SW, Cedar Rapids, Iowa 52404. For more information about this and other programs, call 319-362-8500 or visit www.NCSML.org.